Were they still warm from the dryer, Dennis? You’re doing a lot of work, there. You got to have double serving of treats, too! BOL Dennis!!!! Nothing like wrapping up in a warm towel!!!! Towels have been known to fly around the room harming humans. Good job with the shiv paw. Dennis you are making the rest of Blogville look like a Pack of Slackers… Go ahead… MESS ’em UP. Of course you are Dennis, you are making sure those towels don’t get away, right? Your mom must be thrilled to get all of that great help from you, Dennis! Someone has to guard the laundry, and Trixie is clearly busy with other guard duty tasks. Good of you to pitch in, Dennis! Bedazzling is hard work! You keep spreading those little red sequins of love, Dennis! 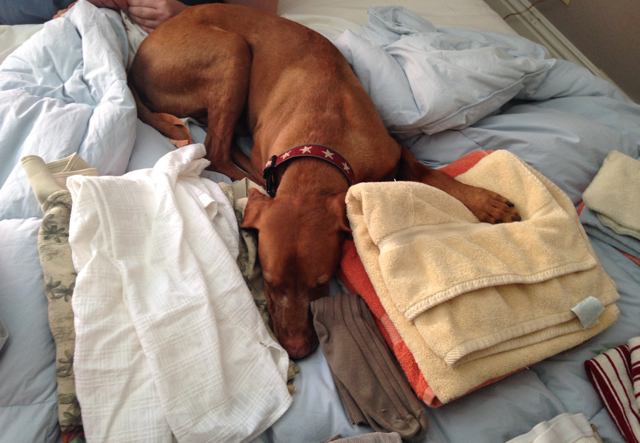 Doing laundry is VERY hard work, I am sure that you washed, dried AND folded efurrything…let Dada put it away for you. A Visla’s work is never done! Good job, Dennis. You know how those silly towels can fly away if you don’t hold on to them! Besides that, they make great pillows if you need one. Fine form Dennis!! Me lubz to sit on da pile of towelz to keep dem frum fallin off da bed or flyin ’round da room!! Dey can bee sneeky rite, rite??? Pee ess: Mum bin sick so we nott bin around much so we gonna try to ketchup!